21 Dhodro Banam, Santal Banam, Santal People lutes, anthropomorphic lutes, Indian Tribal Art. With a writing of the French Artist Fernandez Arman 15 liuti tribali antropomorfi dei Santal del Nord India. “Santhal poetry is Santhal life; Santhal life is Santhal poetry” (Archer W.G. The Hill of Flutes: Life, Love and Poetry in Tribal India, New Delhi, S. Chand & Co (Pvt) Ltd 1974). About the Oral Tradition and Primal Elements in the Santhal Musical Texts see the interesting writing by Mr Onkar Prasad on http://ignca.nic.in/ps_01014.htm . About these musical instruments see the interesting feature “The Lutes of the Santal” by Benght Fosshag on: http://www.tribalarts.com/feature/santal/ . Other informations also on http://en.wikipedia.org/wiki/Santal_music and correlated links. Read also on “Instruments de Musique Des Santal et Des Ho” Francois Pannier Galerie Le Toit Du Monde (http://www.letoitdumonde.net/) , Imprimerie Union, Paris 1991. About the Santal tribal Art see also: http://ethnoflorence.skynetblogs.be/post/6268451/28-santal-parganas-people-carved-wooden-panel at the moment the first and only full screen selection of ancient Santal wedding litter panels of the web. 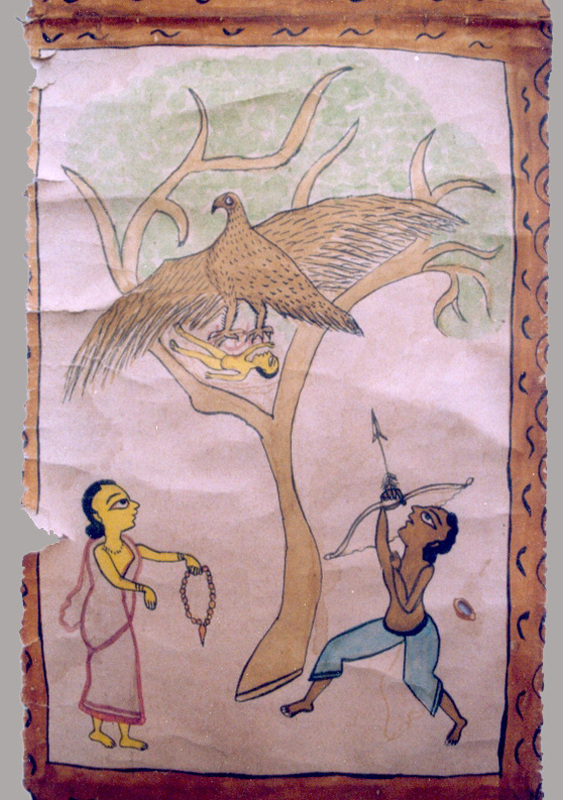 An interesting selection of Santal Parganas Scroll paintings is edited by Hervé Pedriolle on http://santalparganas.blogspot.com/ . and http://sanza.skynetblogs.be/post/6250339/art-et-musique-des-santal-vieles-dhodro-banam ( important and famous the liute n. 10, understanding quality). N1 Top frontal view. Monumental Style of the Santal sculpture. The same style, iconography, and frontal monumentality that we can find in some of the oldest and beautifulst wedding panels of the Santal Parganas tribe. For a style comparation see the unique group of 27 items edited by Ethnoflorence http://ethnoflorence.skynetblogs.be/post/6268451/28-santal-parganas-people-carved-wooden-panel (work in progress). See also on http://www.tribalarts.com/feature/santal/f11.html and http://www.tribalarts.com/feature/santal/f12.html . N1 3/4 Top detail. Dark wood with red reflexes of patina, from gaulic tree. N1 Back side top detail. The Banam resume in its various parts the anatomy of an human being: head, ears, neck, chest and stomach. The string is the most important part of the instrument, because it unites the other parts of the liute together, it’s considered as the breadth of the Banam. The Head (Bonok) of the instrument represents the Space. Neck (hatok) and chest (koram) are directly connected with the Respiration and represents the equivalent natural element of the Air. The stomach (lac) represents the fire. The ears (lutur) the ether. The term banam means body and represents the earth. N1 Back view with traces of use and red patina. Back below view, interesting the detail of an old and original restauration of the lute (in the same wood of the lute). N1 Bis. For a comparation see http://www.tribalarts.com/feature/santal/f9.html . N1 bis Back top view. N1 bis Exceptional patina of the banam. N1 bis back side view. N2 Top view. Three dancers, dressed with a Sari, analogous subject we can find again or in some old photos of Elwin Verrier that in some wedding panels of the Santal Parganas tribe. Detail of a Santal parganas panel, the iconographic comparation it’s evident. (Ethnoflorence Collection) more on http://ethnoflorence.skynetblogs.be/post/6268451/28-santal-parganas-people-carved-wooden-panel . About the exhibition :” Palkee: Wedding Conveyances of North India” at the Crocker Art Museum of Sacramento (216 O street, CA 95814 USA) see also the really interesting link: http://www.crockerartmuseum.org/exhibitions/exhib_pages/Palkee.htm . N2 3/4 Top view. The rigid frontal, really minimal but at the same time also geometrical (see the verticality style of the face) and monumental style of the Santal sculpture it’s evident in this photo. This style remember me some works of Henry Moore of the 40’s. The African plastic tribal styles influenced the western art of the vanguard at the beginning of the century; personally I think that the Indian tribal styles was at that time of the same equally interesting, did not have the lucky to stay in the right place (Paris) and in the right moment (first years of 900s). N2 3/4 top view detail side B. “…un viele Sarangi, venant du Santal, nom en soi, evocatour. Sa presence et sa personnalité nous interpellent. Ce petit chef-d’oeuvre de sculpture attire notre regard au fond du sien. C’est bien ici l’example d’un objet d’artisanat, échappant a son usage pour acceder a l’intemporal”. N2 Back side view detail. To understand better the personality of Fernamdez Arman like artist as well as tribal art collector see the interesting exhibition catalogue “Africarmania: Arman et l’Afrique” (Pierre Nahon-Arman) http://www.ladifference.fr/fiches/livres/africarmania.html or http://www.amazon.ca/Africarmania-Arman-lAfrique-Pierre-Nahon/dp/2729114319 – 81k . N2 Another frontal detail view. N2 Interesting the detail of the fish, carved in a primitive style, on the lateral surface of the lute. 2 bis. Courtesy Arts Premiers Collection Bruxelles. 2 bis. Dancers in frontal and monumental posture. Courtesy Arts Premiers Collection Bruxelles. N 2bis Top back side view. N 2 bis Top frontal view detail. N2 bis Top back exceptional detailed view. N2 bis Top back detail view. A “Viele monocorde”, Nom vernaculaire : “dhodro banam” , is in the Collection of Musée du Quai Branly of Paris under the N° inventaire : 70.2007.48.1. See more on http://www.culture.fr/recherche/?typeSearch=collection&SearchableText=Dhordo&portal_type=CLT_Site_Note . Another interesting piece is in the collection of the Metropolitan Museum of Art in NYC. The piece that I prefer is the Dhodro Banam of the Musée de la Castre of Cannes. N3 Side A top view. The style of this sculpture on the top of the lute it’s really primitive. Raiders are common also in the iconographic style of the Santal panels. N3 Side B, interesting the antrophomorphic style of the lute. N3 Side B view detail. N4 top side view. From the side view the geometric primitive and minimal style of the carved face of one of the dancer, it’s more clear … really understanding. N4 3/4 Top side view. N.4 Primitive carving on the frontal surface of the lute. N4 bis Top frontal view. Courtesy Arts Premiers Collection Bruxelles. N4bis Top frontal view detail. N4bis frontal back and side view. N5 Frontal view of the carved couple on the top of the lute. N5 Top frontal view detail. N5 N5 3/4 top side A view detail. N5 Back top side view detail. N5 bis Top frontal view. Courtesy Sanza Art Premiers Collection Bruxelles. N5 Bis 3/4 back side view. See the stylistic detail of the hair and comapare it with the item n6. N5 Bis Back, frontal and side view. N6 Frontal view top detail. N6 Top side A view. N6 Another side A detail view. N6 top back side view detail. N6 Frontal carved box view. N6 side view, exceptional dark-red patina. N7 exceptional and unique from an stylistic view point antropomorphic lute of the Santal with five figures carved on the top. 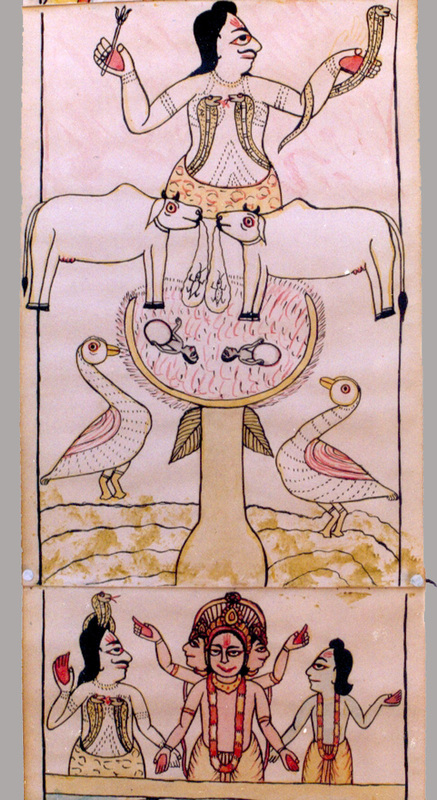 through mask and instrument, link auditory and visual experience in one manifestation of the numinous.” Stella Kramrisch “Unknown India Ritual Art in Tribe and village” Philadelphia 1968. N7 Top side view. Great patina, museum quality sculpture. N7 carved box frontal view. N7 side A detail view. N7 top side B view detail. N7 bis. Top frontal and side view. Minimal and really strong tribal style of the two faces. Courtesy Arts Premiers Collection Bruxelles. N7 bis back front and side view. N9 3/4 top side view. N10 back top side view. N11 back top side view detail. N11 back musical box view. N11 Side A view . N11 Top side A view detail. N11 Side A detail view. N11 Side B view detail. Exceptional red patina of the wood. N11 Side B view . Original restauration detail. N11 top frontal view detail. Exceptional state of usura and patina. N11 Top frontal view detail. N11 bis top frontal and side view. Courtesy Arts Premiers Collection Bruxelles. N11 bis frontal, side and back view. N12 3/4 Side view detail. N12 3/4 Top side view detail. N13 3/4 Top side view. N13 bis fronta and top frontal view detail. Courtesy Arts Premiers Collection Bruxelles. N14 Top frontal view detail. N14 3/4 Top side view. N14 Back top view detail. N15 frontal view. Carved in a primitive manner this lute has a face carved on the top. N15 Top face frontal view detail. N15 Top face side A view detail. N15 Top face side B view detail. N15 Another top frontal view detail. N15 Frontal view. Interesting the red/dark patina of the liute, more clear in the follow photos. N15 Frontal view of the musical box. N15 Base of the liute view. Bor Joep. The Voice of the Sarangi. Delhi: National Centre for the Perfoming Arts, 1987. Charulal Mukherjea, The Santals. Mukherjea and Co editions, Calcutta, 1962. Chattopadhyaya, Kamaladevi. Tribalism in India. New Delhi, 1978. Culshaw, W. J. Tribal Heritage; a Study of the Santals. London: Lutterworth Press, 1949. Danieloud, Alain. “Sudasien”. Musikgeshichte in Bildern 1,4 (1978) and La Musique de l’Inde du Nord. Buchet-Chastel editions. Dietrich, Would and Bengt Fosshag. Aussereuropaische lauten, Werkzeug und Kunstwerk, Frankfurt 1992. Leuzinger, Elsy. Propylaen Kunstgeschichte. Die Kunst der Naturvolken. Frankfurt, 1978. Mode, Heinz and Subodh Chandra. Indische Volkskunsy. Leipzig, 1984. Indian Folk Art. Leipzig/New York 1985. Prasad Onkar, Santal Music. New Delhi, 1985. Sachs Curt. Die Musikinstrumente Indiens und Indonesiens. Berlin & Leipzig, 1923. Shirali, Vishnudass Sargam. An Introduction to Indian Music. New Delhi, 1977. Verrier Elwin. The Tribal Art of Middle India. London 1951. TIRIO: A bamboo flute with seven holes, symbol of love and seduction it’s the most popular in the Santal culure. DHRODO BANAM: Bowed lute carved out a single log of wood. PHET BANAM: Lute with three or four strings, the waist part of the instrument is completely covered by animal skin. TUMDAK: Knowed also as MADOL, is a double faces drum with a body brunt clay. TAMAK: Bowl shaped kettle drum. JUNKO: Onomatopeic description of the sound of the anckle bells, cast in metal in the shape of buds and tied to the feet of dancers from where produce a rythmical sounds.